If you have been following my blog, you will remember that I wrote about a clip board manager called Ditto a few months ago. This is even better. ClipX is clip board manager, one that is sorely missing in Windows. You copy an item into the clip board using Ctrl+C and the last item you had copied gets replaced by the new one. At any point of time, the clipboard can hold only one item. How frustrating can that be! This is why you need a clip board manager. And believe me, if you aren't using one you are wasting a lot of your time. When ClipX is running, it captures all that you copy onto your clip board including text and images. In other words, every time you press Ctrl+C, the copied item gets lined up on ClipX. Pressing Ctrl+V will paste the last copied item, just like normal Windows clipboard. But pressing Ctrl+Shift+V will display the list of copied items. You can now choose which one you want to paste. The number of items you want to keep on the clipboard can be adjusted. Even the hotkey combination can be changed. 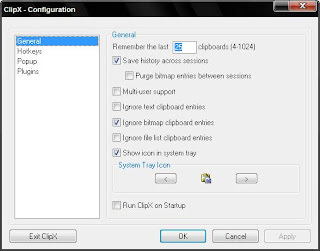 The clipboard is also available by clicking on ClipX in the system tray. Or you can also create "hot zones" on your screen like the top-left corner; moving the mouse pointer to the hot zone will launch ClipX. It's so easy to use, you will fall in love with it. And did I mention it's free? This is of course a good utility. I am using the Clipmate 7 which is very good. But I experience one problem. Whenever a non-English text, say, an indic language text like Tamil, these applications simply put only ??? marks thereby defeating our very purpose of copying. In windows we have no such problem. My repeated requests to the support section of these softwares are yet to be answered But for this problem, clipmate or clipX are very good. I wasn't aware of this problem. It's sad the support section is not replying. They should take such feature requests from users seriously. thiruthiru: there is not such problem with clipx, I can copy chinese, tahi, arabic, etc, and they show up fine in the menu.